D. F. Williams started the business off in Oxford on the back of there window cleaning expertise. Things have changed slightly since the early days but the ethos hasn’t and we still offer the same customer service only now with better window cleaning equipment. 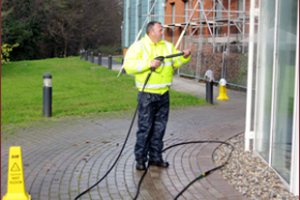 We offer window cleans for Offices, Shops, Collages and Large Residential Houses using both traditional cleaning methods and new filtered water systems to give a bacteria free clean. Our staff our fully trained and have the relevant training to clean windows that a simple ladder and brush will not reach. Although were based in Oxford we clean windows all over the wider Oxfordshire area. Shop fronts are a large part of our business often shop fronts and door ways are miss-used by the public so we also clean that area as well.